Your privacy and security is very important to us. To better protect your privacy, we provide this notice explaining our online information practices. 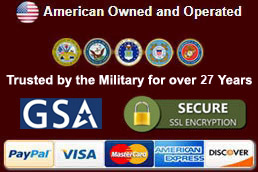 This website uses SSL Encryption for safe and secure online ordering. Purchaser/User must be 18 years old and of legal age to purchase items on this website. This notice applies to all information collected or submitted on the website and on the secure Customer Service Website. Within our secure network, you can order products, register to receive information and request new products. We never sell or share any information provided to us online in ways unrelated to the ones described above. By placing an order with us, you do agree to receive occasional emails regarding new products and product updates. If you wish not to receive these product updates an opt-out feature will be provided. Updates and corrections can be made in your order information by sending us a request using the online forms at the secure Customer Service Website. Requests must be made using the identical email address provided on the original order. We use this secure process to better safeguard your information. 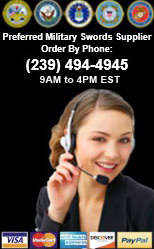 All customer information is confidentially handled. No information on our customers is sold or released to any third parties except to the extent necessary to complete the order. In a case where slander or libel may have been committed by the customer, documented customer communications may be released. Customers shall not, nor shall they permit or assist others to abuse or fraudulently use this website, including but not limited to the following: Sending unsolicited email, obtaining or attempting to obtain products by any means with intent to avoid payment, unauthorized access or any attempt thereof to alter any information of any customers, knowingly engaging in any activities that will cause a denial of service (e.g., profanity), any attempt to interfere with the network, violating the law or aiding in any unlawful act. Purchaser/User assumes all risk. Swords Direct does not warrant that any individual or company may legally purchase, possess, sell or carry any items offered. It is the responsibility of the Purchaser/User to comply with federal, state and local laws. By purchasing any item, the Purchaser/User warrants that he is in compliance with all federal, state and local laws, he is legally allowed to purchase these items, and he understands and agrees to all terms and conditions.